As if eight temples yesterday weren’t enough to more than satisfy my RYA [Recommended Yearly Allowance] for 2013 of piles of old stones, today we were timetabled to see three more. 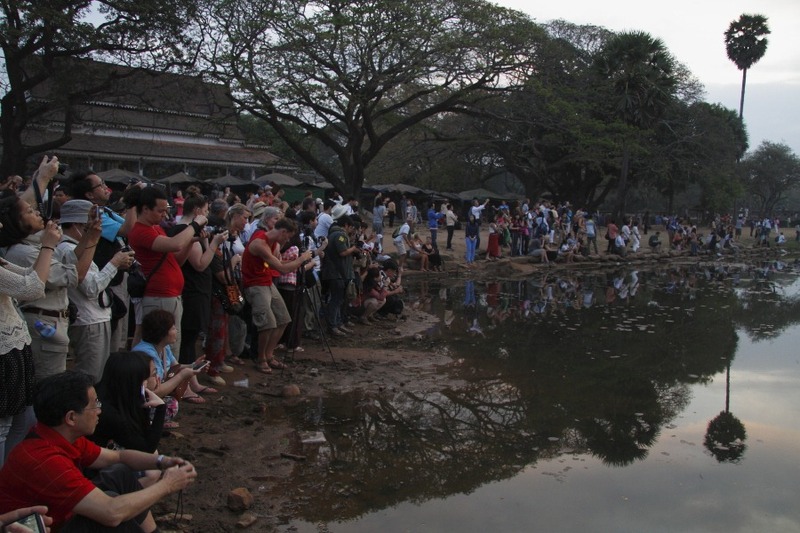 The icing on the temple was a 4:15 AM alarm in order to be ready for a 5:00 AM departure to join the crowds of other tourists intent on waiting for sunrise over the star Cambodian tourist attraction, the majestic temple of Angkor Wat. Selin, our guide, told us that Angkor Wat is visited by 10K tourists per day in peak season. In low season, the number drops to about 4K. We are here towards the later stages of peak season and the daily count now would be about 8K a day. They aren’t all mad enough to pitch up before the sun has risen but a good amount of them do. Torches, tripods and cameras in hand, we had our $40-a-head 3-day passes checked by officials and were shepherded in at 5:30AM to the prime Angkor Wat sunrise viewing spot across one of the reflecting pools – the one that still has some water in it. Mercifully we were early enough to be in the vanguard and got good pole positions. As Francine began setting up her tripod, we settled down patiently for our 1-hour wait for Mr Apollo. The sky behind the towers of the Angkor Wat temple looked disturbingly clouded, to me, and, to cut a long wait short, Mr Apollo pulled a nifty disappearing trick when he should have been appearing; sunrise never really did happen. Poor Mr Apollo was covered by the cloud. Certainly the sky lightened and some silhouette-type shots were possible but a more orange backdrop would have been much more photogenic. As the light did build I noticed another little gotcha: there were a couple of very large areas of Angkor Wat roofline adorned by ugly green tarpaulins covering restoration work. Too much daylight and the full frontal shot would be ruined. Quelle domage! 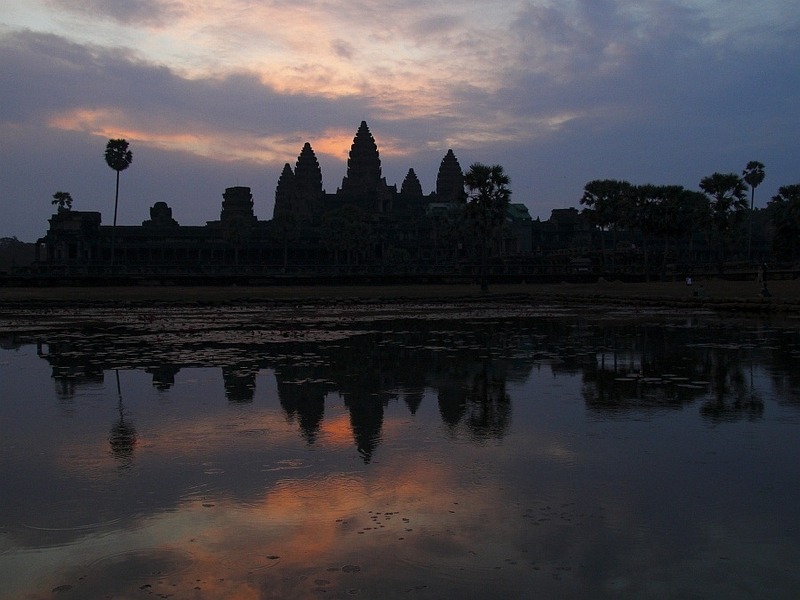 Remembering something of yesterday’s Temples 101 lesson, Angkor Wat was a Hindu-built temple. 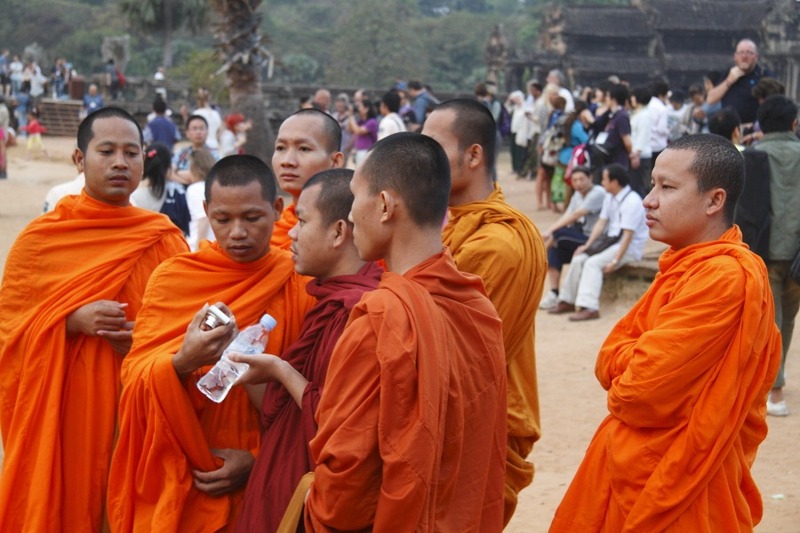 I was vaguely amused, however when, after full daylight had begun, I saw a small group of Buddhist monks taking pictures of themselves before the Angkor Wat backdrop and studying the result on their digital camera. With our temple count now standing at nine, we went off to another two to bring our grand total to 11. I stayed outside the final temple studying dragonflies on the moat while Francine dutifully went inside with our culture guide. Now was when we started seeing the real Cambodia, to my mind. 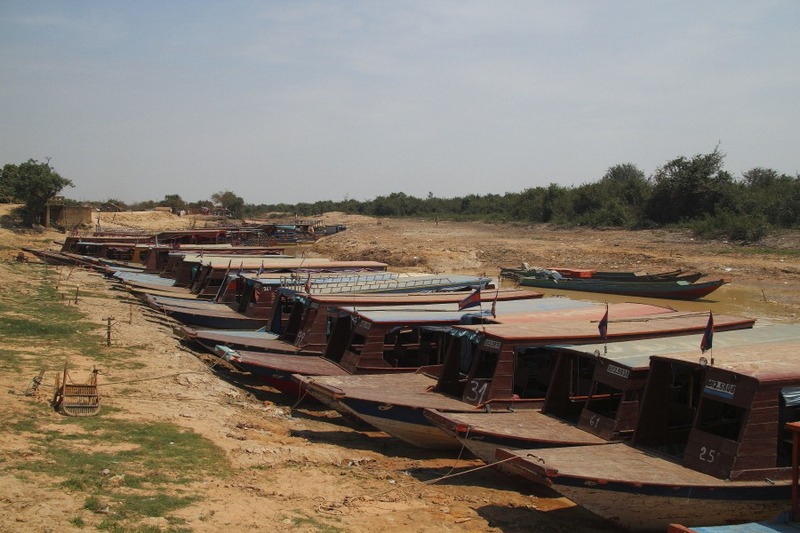 Cambodia has the largest fresh water lake in south-east Asia where many fishing communities scratch out a living. 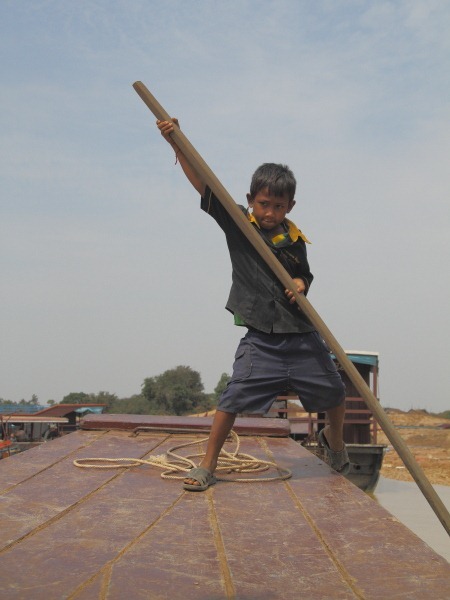 Some are floating villages but we were bound for one, Kompong Pluk, built on 7mtr/24ft stilts. 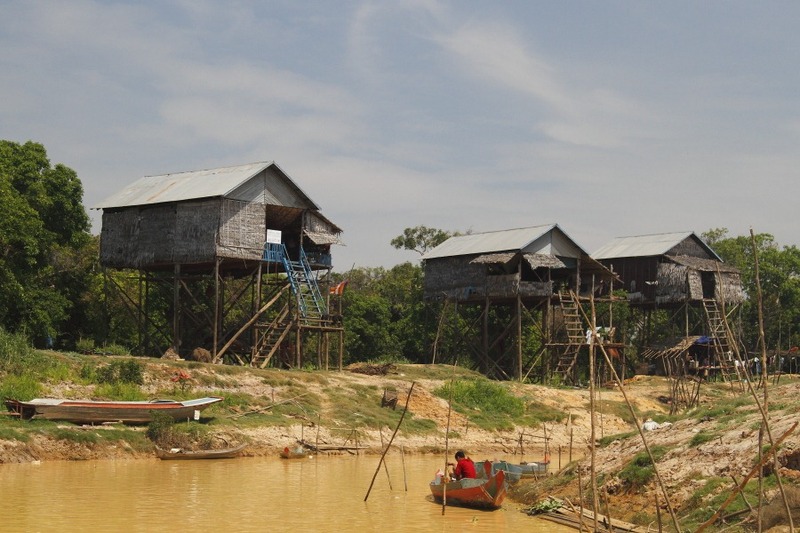 The stilts are necessary to cope with the change in water level between dry season (now) and wet season. We were heading for a picnic lunch aboard what loosely falls into the category of a boat. As the water level drops in the lake’s tributary rivers, so the boats move down closer to the lake. Our ride down the river felt like a mixture of floating and sliding over silt/mud, so low was the water. The boat controls were rudimentary but the young crew of two seemed to understand it inherently. With the elder one of the pair driving and what I can only describe as a small school child fending off and assisting by punting using a pole much larger in diameter than his tiny hands, we completed a very interesting ride down stream past stilted-house fishing communities. It was a truly fascinating and sobering education. all presented in a delightful woven basket and very good it was, too. For lunchtime entertainment, we were treated to a display of the local fishing technique: two guys were dropped off from a boat with a large net suspended between poles and with this deployed, they proceed to walk along. Clearly, in dry season even the lake is not very deep. Our way home took us back past the stilted accommodations of the fishing folk and into a land-based Cambodian village. 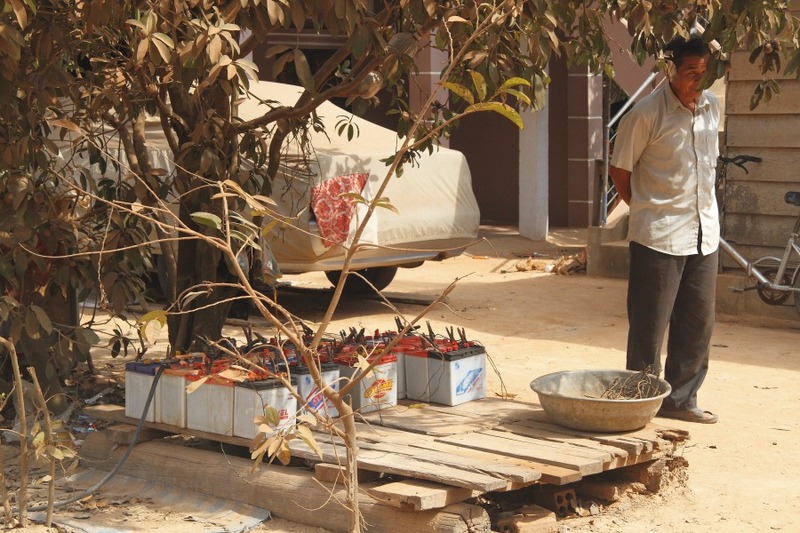 Here we stopped to walk along the local street and learned that the houses do not have electric city (I loved that – no mocking, I don’t speak a single word of Cambodian, after all) but the people used car batteries to power electric light. Not having electric city, the batteries run flat but someone in the village has a generator and acts as a recharging station. Here are a number of batteries being recharged. To me, this last half of the day meant so much more than countless temples of yesteryear. This was an education. This is how 80% of Cambodians live. 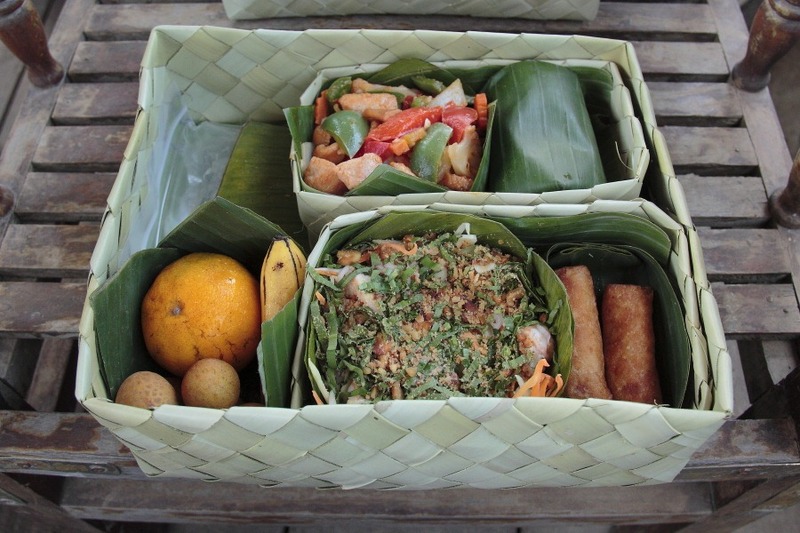 This is what most people in Cambodia are all about.